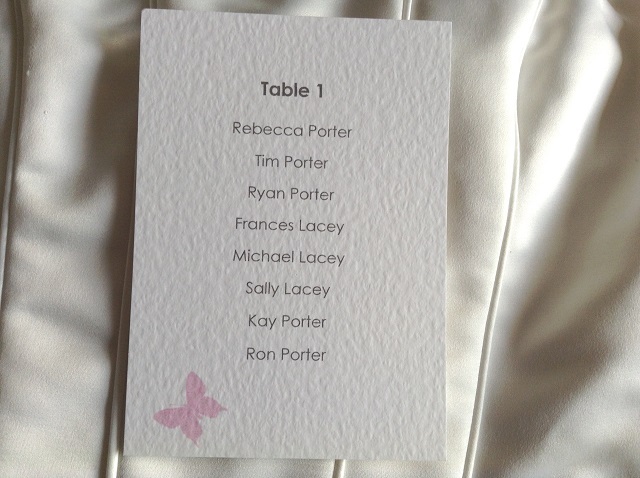 Pink Butterfly A6 Rectangular Table Plan Cards are available on a thick (270gsm) white or ivory hammered card. Choose you font style and colour to match a theme and mount them on your own board. Guests are saved from the mad panic of trying to find a seat on a table with their friends/family, and you can place people where they’ll be happiest! Making sure everyone is seated next to like minded people will ensure your reception has a good atmosphere and guests are happy chatting at their tables rather than making a dash for the exit it as soon as the reception is over!